Answers to commonly asked questions. Find out how your gift is applied. As you look forward to your experiences beyond UIW, it is also important to remember what the University has meant and done for you. This is why participating in the Graduating Class Campaign is an important part of your journey from student to alumni. What is the Graduating Class Campaign? The Graduating Class Campaign offers all graduating students the opportunity to commemorate their time at UIW and support future Cardinals by making a contribution to the university. The campaign’s mission is to begin building a legacy of alumni engagement and promote a philanthropic spirit by making your first time donation to the University of the Incarnate Word. 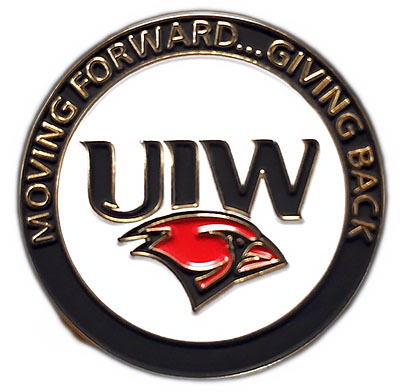 $20.19 –> donate in honor of your graduation year to receive your UIW Graduating Class Campaign lapel pin. Plus, get your adhesive Cell Phone Pocket! $50.00 –> receive your UIW Graduating Class Campaign lapel pin* in return for your generosity and designate up to two (2) honorees to receive THANK YOU cards. In addition, receive your adhesive Cell Phone Pocket! $100.00 or more –> receive your UIW Graduating Class Campaign lapel pin*, designate up to four (4) honorees to receive THANK YOU cards, get your adhesive Cell Phone Pocket, and be entered into a drawing to win VIP seating tickets at commencement PLUS parking pass. Furthermore, you will receive special recognition as a leadership donor in UIW’s Honor Roll of Donors issued in the Word Magazine in November. *NOTE: the UIW Graduating Class Campaign lapel pin is part of the regalia at commencement; it is the one and ONLY pin students are allowed to wear at the graduation ceremony for becoming UIW supporters. What are the Campaign’s goals? 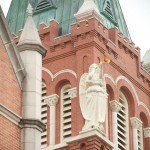 The campaign’s goal is to achieve a 15% participation rate. Regardless of the amount, your contribution is highly important to the campaign and sends a meaningful message: loyalty and commitment to UIW and its Mission. Your participation, along with the gifts of your classmates quickly add up and are essential to ensure a quality education for current and future UIW students! Because you value your education and know it’s an investment. Because you are satisfied with the education you received at UIW and believe your experience will have a positive impact on your life. Because 94% of our student population receives financial aid and you believe in paying it forward so that other students can have the same great experience you had. Because you want to express your gratitude to others for being supportive by honoring them with THANK YOU cards. Because you want to take part in setting a NEW tradition and leave your legacy at UIW. How does my participation have an impact? Aside from supporting current and future UIW students, your donation has a significant and meaningful impact for YOU and the university. Alumni giving affects universities’ national rankings and is measured by the percentage of alumni who financially support their alma mater annually. As more alumni contribute, the higher UIW’s ranking will become, making YOUR degree more valuable to potential employers and graduate schools. Where can I designate my donation? The power of philanthropy is in your hands, YOU designate your gift to the area of your choice, whether it be your favorite athletic team, or your academic department/program, you decide where your money goes. To have the greatest impact, we encourage you to donate to the area of greatest need, the UIW Scholarship Fund.